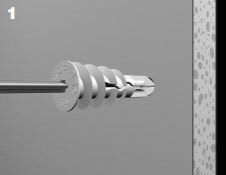 The TOGGLER SnapSkru self-drilling drywall anchor needs no drill and installs as quickly and easily as an ordinary self-drilling drywall "auger" anchor, but its unique "Snap Lock" feature provides the positive behind-the-wall locking and holding power of a toggle bolt. Press tip of SnapSkru anchor into drywall using #2 Phillips screwdriver or screw gun. 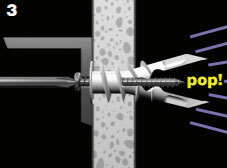 Drive anchor clockwise into drywall until anchor sotops flush with the outer wall surface. Place item over anchor and insert any fully-threaded screw of appropriate size (either #6, #8 or #10). Thighten screw flush with item. 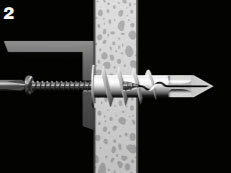 The screw pops open the anchor, locking it on the wall and holding the gypsum board in compression. This reinforces the wall, increasing its holding power significantly.